We are a non-profit organization that provides employment, residential and support services to adults with intellectual disabilities in Summerside, Prince Edward Island. Community Connections Inc. is a non-profit organization that provides a range of employment, residential, and support services to adult persons with disabilities. With an emphasis on persons with intellectual disabilities, the organization supports clients and families who reside in the region of East Prince, Prince Edward Island. The organization is based in the city of Summerside. Community Connections was established in September of 1996 to coordinate the provision of disability services that was provided by the three former agencies of SAW Industries Inc.; Summerside Group Home and East Prince Residential Services; and the Summerside Adult Development Centre. Community Connections is administered by a 14 member volunteer Board of Directors. The purpose of the organization is to work with persons with disabilities and their families; to assist individuals to develop to their full potential; to support them to access and use community resources; and to empower them to contribute and participate in a meaningful way within their community. Keeping in mind a view of the whole person, the mission of Community Connections Inc. is to provide client-centered services to adults with intellectual disabilities in the East Prince region. These services address the areas of employment, residential, family support and other community options. The purpose of the Agency is to work with clients and their families to develop the clients’ full potential, to support them to access and use community resources, to empower them to contribute and participate in a meaningful way within their community. A responsibility of the Agency is to work in partnership with East Prince Health to obtain their commitment and funding resources for the provision of services, collaborate with other community stakeholders to ensure the inclusion of persons with mental handicaps in their community and provide qualified staff to work with clients and their families. 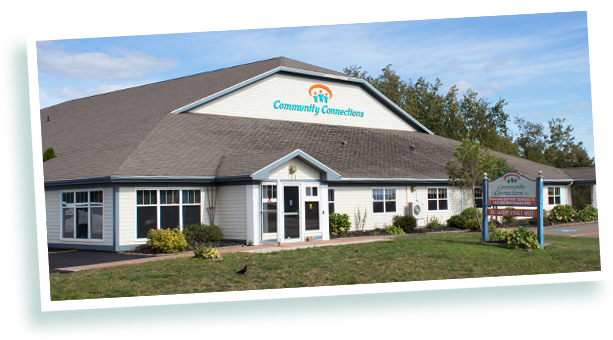 Community Connections is a non-profit organization located in Summerside PEI. It is administered by a volunteer Board of Directors. Established in 1996, Community Connections is non-governmental organization (NGO) that provides a range of employment, residential, and support services to adult persons with disabilities.